The most iconic sneaker design brought into the modern age. A sporty, streamlined version of a retro runner style. The shoe, which looks stylish on every guy from tall to short, from a teen to a grandpa. Or, in other words, the New Balance 574 Sport – a completely re-engineered version of the classic 574 silhouette, a much-favored 80s’ runner. Released in July 2017 with a $120 price tag, the two colorways set of a minimalist vibe to the 574’s retro silhouette has challenged the sports footwear market dramatically. The New Balance 574 Sport has not only a modified design, but more importantly, updated filling: cushioning, stabilizing, and shock absorbing technologies of the new generation. Our research team is convinced that the New Balance 574 Sport is a great value for money. Want to make sure too? Follow this guide to see the most outstanding colorways of the model and the major wearing advantages. Earth-tone styles “Mountain Olive” and “Deep Sea Blue” diversified the NB 576 Sport collection in September 2017 to add some cool colorways to your fall-ready sneakers collection. This new extension of the ever-expanding 574 collection in amazing Olive is a catchy combination of old and new styles rolled into one. It’s a fantastic contemporary mixture of premium suede, heathered stretch mesh, white leather, and minimalism. These running shoes from New Balance are meant to fill every day of your life with an impeccable style and the most comfortable walking experience ever. New Balance 574 “Burgundy” along with “Mint” – both are unisex iterations of the legendary classic model. This sneaker is made in a stylish tonal burgundy colorway and features a super breathable and lightweight upper construction. Contrasting synthetic and mesh textures, geometric midsole, monochrome profile, clean white outsole, and welded ‘N’ logos at the sides complete the clean streamlined look of the New Balance 574 Maroon. Want to stand out this fall? New Balance has an ideal option for you! New Balance 574 Sport Mita is one of the most successful products of the Mita sneakers and New Balance collaboration. This effortlessly stylish shoe defies tradition and demonstrates a brand new silhouette that can trend in modern market – and all that within the old good 574 model. This sneaker features two suede areas: one, blue, in the toe box, and the second, grey, on the heel. The mid-section receives a leather makeover with reflective light grey “N” logos on both side panels. Also, the NB 574 Sport Mita comfy heel pull tabs, a tri-blend colored Fresh Foam midsole, and a Pale rubber outsole. The NB 574 Sport Wheat is a new all-suede construction in earthy tan shades. The “Wheat” colorway has become a true cultural trending phenomenon within different brands, however, the New Balance has managed to harmoniously implement this up-to-date color trend into the classic NB design. So, how did all that work out? Pretty nice. The result is a favorite quality sneaker, dressed in a tonal suede colorway, perfect for autumn and spring. The New Balance 574 Sport black and red is a representative of the first version of this model, released as early as on July 15, 2017. The upper of the shoe is made of a premium black nubuck with a mesh vamp and side inserts. On the sides, there are traditional reflective leather “N” logos, and heel tab with heel pulls are also made of leather. A comfortable and adjusted fit of this bootie construction is guaranteed by means of flat cotton laces, which securely fix the foot in the shoe. A new blocked Fresh Foam midsole doesn’t only invests into cushioning and responsiveness of the shoe, but also makes them more colorful, adding the small hits of black, grey and red. The New Balance 574 Sport comes with a breathtaking range of colorways and material options. Suede, synthetic, leather, mesh constructions are possible in multiple color combinations from classic black and white, neutral “earthy” shades, to rich and vivid burgundy, red, and vibrant blue. This shoe features a very sleek minimalist profile with geometric accents. However, it doesn’t prevent the sneaker to be a lightweight, foot-hugging bootie construction – not bulky, but secure. Traditional “N” logos on the lateral and medial sides are stitched or fused on the synthetic material underneath them, and another NB branding is also stitched or welded to the mesh on the soft tongue. The collar is also properly padded for extra comfort. The TPU piece extends from the top lace eyelets back to the heel (just like the original 574 has) and makes the shoe maximally secure. Also, there are comfy heel pull loops for easier on and off. On the inside, you’ll find a breathable one-piece mesh lining and a removable cushioned insert, which can be replaced with any other orthotic. The sole is decorated with a geometric pattern and is made of an updated foam compound and durable rubber compound on the outsole. The weight of this shoe is perfect for walking, running, and doing various exercises. Both the midsole and upper materials are incredibly lightweight, allowing for free motion without weighing you down or sacrificing the security of the New Balance 574 Sport. Fresh Foam cushioning and the Abzorb crash pad blend in the midsole of the shoe to provide you with added all-day comfort, cushioning, support, shock absorption, energy dispersion, and distributing impact to a larger area of the sole. Besides, the NB 574 S features a removable insole, which offers additional cushioning. As the forefoot of the majority colorways is covered with a breathable mesh material, and the lining is also a one-piece mesh, the New Balance 574 Sport keeps your feet from sweating and smell even after an intensive cross-fit training session, let alone an ordinary walk. The sole is made of a lightweight long-lasting rubber material, which is durable enough and suitable for a variety of flat surfaces from track to treadmill or wooden floor. 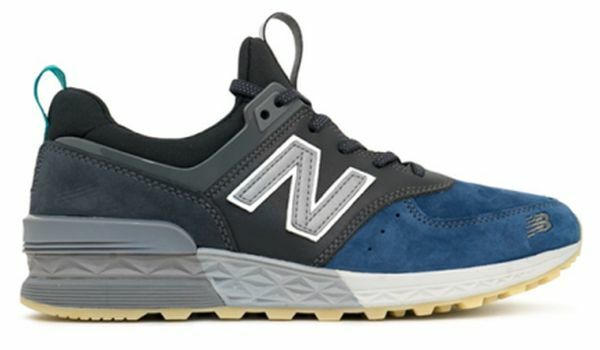 It was noted by lots of buyers that a high instep, a properly padded tongue, which is connected to the collar, and a bootie construction of the New Balance 574 Sport make this shoe extremely comfortable even in case of all-day wear. What makes this sneaker stable is a TPU overlay, which supports and stabilizes the heel, preventing different injuries. Also, the extended height around the ankle adds some extra support, particularly during lateral movements. A nylon pull tab is a small detail on the heel of the sneaker that helps you put on and take off the NB 574 S effortlessly, just like a slip-on shoe. Removable insole is always a useful detail, especially if you have problematic feet. It’s not a big deal to change the insole for another orthotic, which you’re used to and relax the comfort and support of the shoe. The ABZORB heel technology delivers a superior blend of cushioning and compression set. It’s a unique blend of isoprene rubber for a perfect and comfortable run. This technology provides shock absorption and excellent resistance to the pressure exerted on the sole and quickly comes back into its original shape. It can withstand impact for a prolonged time versus having just an EVA foam. The Fresh Foam is an innovative midsole material, introduced by New Balance in 2013. It’s created from a single piece of foam that provides a cushioned, more natural ride. ENCAP in the heel area is a core of EVA encapsulated within a shell of polyurethane for added stability and shock dispersion. TPU heel clip fixes the foot in a secure position to prevent injuries during the movement. The New Balance 574 Sports is a seamless blend of modern and classic, of performance technology and recognizable and timeless style, of comfort and fashion. This shoe has been highly evaluated by our research team, as well as received good remarks from sneaker enthusiasts and NB supporters all over the world. If you’re looking for a high quality, comfortable, breathable shoe, stuffed with modern technologies, which reminds of sweet 1980s, the twisted version of the New Balance 574 Sport is what you need.